Family run bed and breakfast set in it's own grounds in the calm of the Tarn countryside. Large room with ensuite bathroom, own balcony and access to swimming pool. 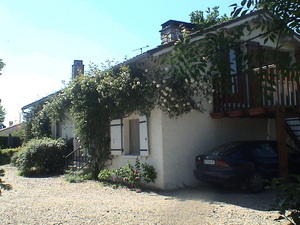 Bed and breakfast, family run, in it's own gardens with plenty of parking and swimming pool. Easy access to Toulouse, Carcassonne airports and Albi. The bedroom has a double bed, a double sofa bed, ensuite shower and toilet, fridge and tea/coffee making facilities. Access is via it's own balcony with table and chairs. Local shops, boulangerie, restaurants within walking distance. Black mountains, Golf, Horse riding, Canoeing, Waterparks, local markets, historic cathar sites, mediterranean and Pyrenees 2hrs away. Exit Servies with the village square and restaurant on your right. Take the small road on the left to Las Boundos just before the railway crossing. Mistletoe is the first house on the right.